Terence Crawford is regarded as a considerable favorite to beat Amir Khan on April 20, but don’t expect the unbeaten pound-for-pound king to blindly believe the fight will go chalk. The switch-hitter from Omaha, Neb. is covering all bases ahead of his second welterweight title defense, which will headline an ESPN Pay-Per-View telecast live from Madison Square Garden in New York City. He fights for the third time on location, scoring stoppage victories in each of his previous two trips. Coupled with Khan’s historically weak chin—having been down 11 times and stopped three times in his 14-year pro career—it reads as the formula for yet another knockout night. That said, Crawford hasn’t made it this far just on the assumption of how a fight will play out. Crawford nearly went the full 12-round distance in his last bout, knocking out previously unbeaten Jose Benavidez Jr. with just 18 seconds to go in their ESPN headliner last October. The feat was one of 10 stoppage victories he’s recorded in 12 career title fights spanning three weight divisions. The ability to carry his finishing ability up the scale speaks more to his skillset than one-punch knockout ability. Crawford’s ring IQ and on-the-fly adaptability has made him virtually impossible to conquer through 11 years as a pro, and—as he sees it—will be the key to recording the 35th victory of his career. 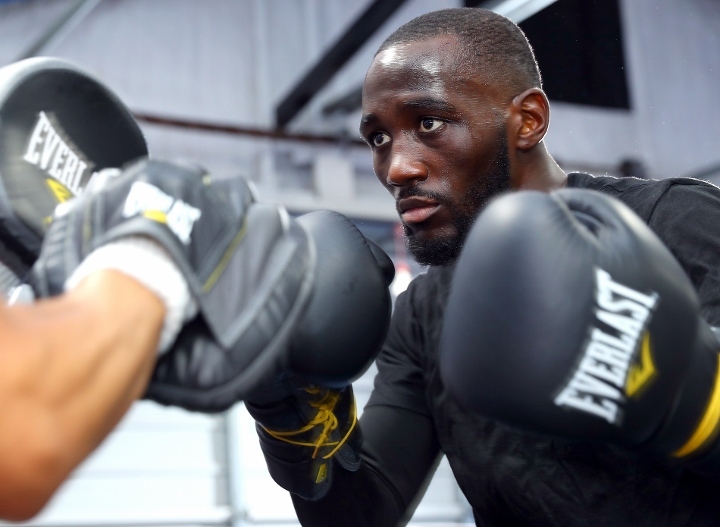 “I know the troubles I can have with a fighter like him,” Crawford admits of England’s Khan (33-4, 20KOs), a former 140-pound titlist who is 5-0 as a welterweight but also a massive underdog. “He has everything to gain and nothing to lose. To that, Crawford leaves the “figuring out” part to his corner, whose job includes anticipating whatever adjustments are already being planned by Khan and his team. “He’s a determined fighter who’s here to get the job done,” Brian ‘Bomac’ McIntyre, Crawford’s longtime trainer and manager says of Khan. “He’s coming here to upset Terence. Not one person on this team is going to take Khan lightly. All of that leads right back to the leading pound-for-pound entrant refusing to leave anything to chance.